After Maxis Hotlink introduced their Bagus 5 couple months ago, DiGi has recently introduced another similar plan – DG Prepaid Smart Plan. Why I said value less than RM 15? 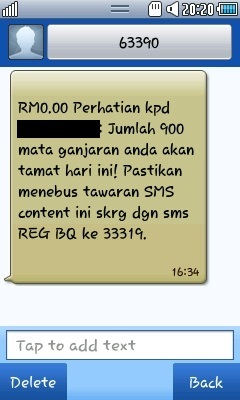 Look at the voice 30 minutes with RM 0.15/minute (total RM 4.50), 30 SMS with RM 0.10 each (total RM 3), 30 MMS with RM 0.25 each (total RM 7.50), all sum up are RM 15, still haven’t included 100MB Data, why I still said value less than RM 15 ? This entry was posted in Communication and tagged Bagus, data, mms, sms, voice on June 4, 2012 by RMvalues.